i can't remember what the name of mine is - she's a redhead who came dressed for the alpine forest. she's beautiful. right now she's in a bunny costume. 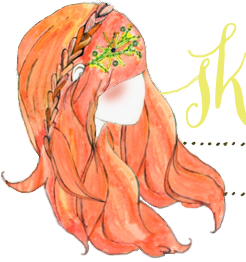 i realized i never sent you a link to my mom's shop! http://www.etsy.com/shop/blythesocdcloset there's not a whole lot in there now BUT check out her sold items. she has made some awesome dresses! Ok so I've never been a fan of Blythe dolls, but you have made them SO cute! I can't believe I'm actually starting to love them! Where do you get your eye chips? I was going to buy some from This is Blythe. I don't really care about "my" favorite blythe as much as I wish I had the money to buy my sister the Alice in Wonderland one. She just loves Alice in Wonderland! I get my eye chips from This is Blythe. I usually buy the big grab bag and then see what works with which girl. Oh my god! How could I forget about Matryoshka Maiden!? I would love her! I didn't realize TIB had a grab bag! Check that out..now! Blythe's are new to me. I've seen Blythe postcards and such but recently I'm learning more about them. I can see how they would become addicting. I'm curious how tall are they? And whats an average price to spend on one? 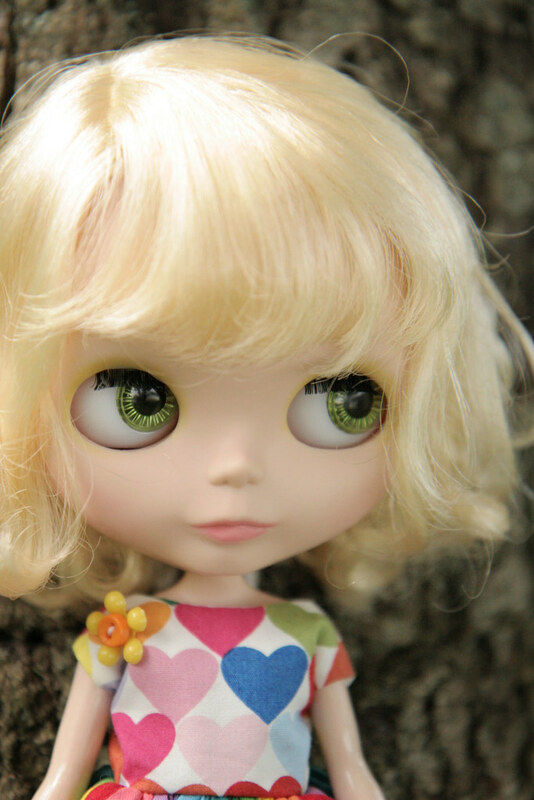 I am thinking about getting my 8 year old a Blythe. So I can play with it. : ) I am not sure where to start. What brand are yours? Kenner, Ashton Drake? My older sister had the original 1972 Blythe from Kenner. Those are a little (a lot) out of my price range. I love your blog by the way. Your creature are to die for. My daughter is in love with Gallop! Hollywood has been my favourite blythe from the start, but I feel very happy with my Velvet Minuet (Pauline) and my Feel The Sky (Jackie). I just received my Sunshine Holiday girl! She's so cute. But it seems like maybe she's not as good of quality as my PrimaDolly Ashlette that I bought 2 years ago. Have you seen the quality go down in your Blythes? Maybe there are 2 manufacturers and I don't realize it! Either way, she's very cute. 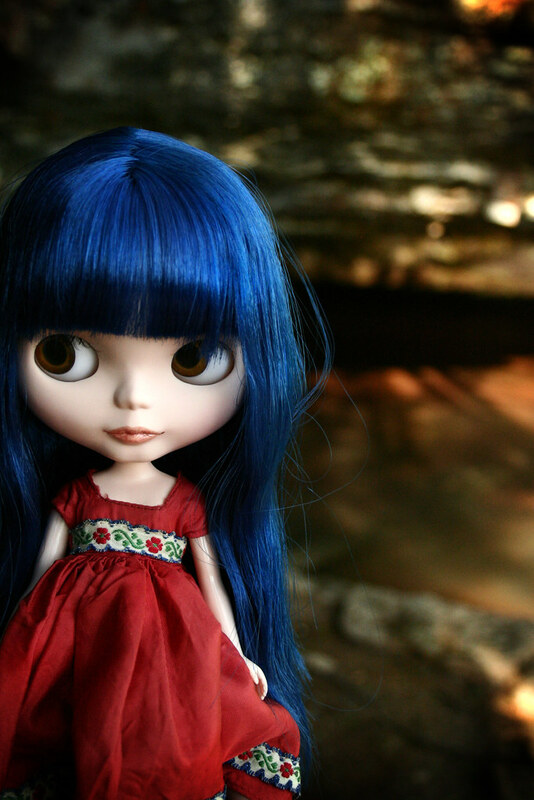 I also purchased a Pullip doll recently (from The Valley of the Dolls) and I LOVE her too. Her expression is just adorable! Your Blythes are are so sweet! Thanks for the tips on learning to customize! Thanks for all the info. I have spent waaay too much on the cutest clothes on etsy for my new gal! ;) I "heart" my friendly freckles Blyth & my daughter has a "roaring red" Blythe(I got a GREAT deal on ebay). We instantly gave her a new hairdo and outfit.. not so cute before. ;) I also scored an amazing doll carrier/closet that we are going to give a make over! Thanks for the link to the forum, I think that will be a great place for us Pullip collectors too! Blythes are 14 inches tall. I was surprised (pleasantly) by the size when my first one arrived. I can't even sight an average price really. I guess the $200 range would be semi-average. The prices are seeming to go up lately, which I'm not crazy about. Ria, mine is a Takara. An Ashton-Drake would be fine for your little gal, or any of the other girls. Not a Kenner, though. I can't see myself ever dishing out the $$$. I'm a little jealous of you girls with Friendly Freckles. I'm trying really hard not to buy her right now, but I'm probably going to end up with her. It's so hard deciding which one I want next!!! thanks for the info dear. . . nice to know where to get info and goodies for these dollies. 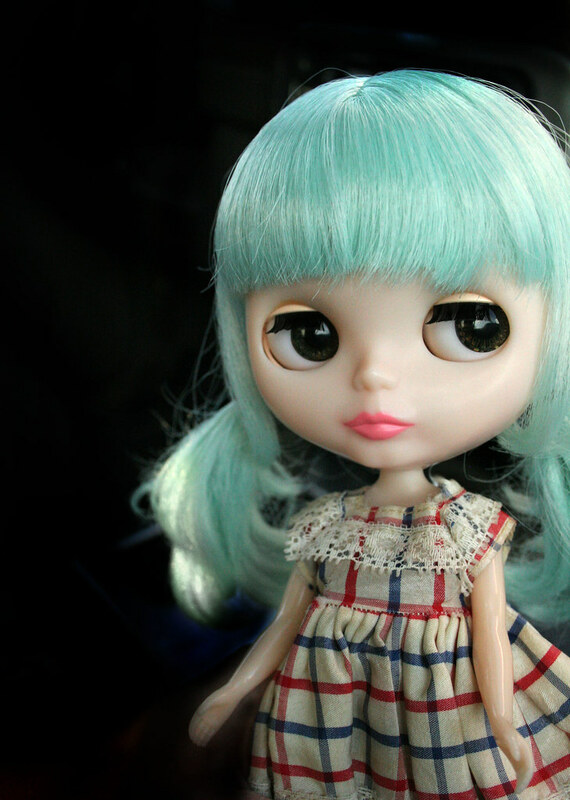 . .
my fav Blythe right now is NOSTALGIC POP. . .
i want her SOOOO bad i can tastes it! i also have been spying the new Simply Mango and Simply Guava. . . i have a Simply Peppermint and she would love to have her South American sisters join her! did you see that they come with doggies? Aaaaa! You said Ribbonetta Wish! I waaaaaaant her, but she is kinda out of my price range right now. The bad part is that she was much, much cheaper when she was released. :( Still, she is at the top of my wish list! I really like the Zooey blythe and Willa. Wouldn't it be cute to make a Coraline doll??? It would be really perfect cause the dolls have cute large eyes! Oh yay! I'm so glad you posted this. I have my eye on the casiopea spice blythe that's coming out this month. It's because she has the same color hair as me. Thanks so much for the info! This is exciting! I'm laughing because of what you said at the beginning of the post, about hating bloggers who apologize for not blogging...*confession time* I am one of those! on another note, I'm really wanting one of those little creepy-cute-mischievous-looking dollies :) I would dress it up all day long! what made you start collecting these? just curious. did you collect dolls as a child? you kinda look like a doll. hhhmm,,i'm not sure what the name of mine is either? ?,,i bought her in tokyo, japan at the junie moon store! !,,i had to part with the box as it didn't fit in our luggage :-( She came with purple hair, but now has a black wig! !,,thank you for posting all this awesome info!! !,,,i wanna try and customize her but i'm so scared to ruin her!! !,,oh!,, and i'm super excited for your shop update!!!! eeek!!! 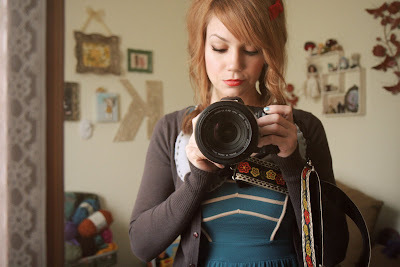 firstly im new to your blog and i LOVE it!"!! my blythe is a stargazer which i got from brighton in england! love her my mum left her on the doorstep and knocked on the door and when i opened it she was there!!! i wanna get another very soon she is my first and only blythe and ive had her for 2 years!!! i tihnk its really cute that u and ur daughter have a blythe doll each! i hope one day i have a kiddie who wants to play dolls with me!! !